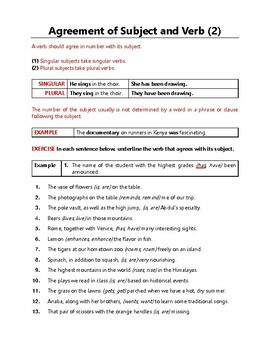 This high school resource contains 16 worksheets; the total of 47 pages, with full answer Keys about Subject Verb Agreement for Grade 9 and Grade 10. 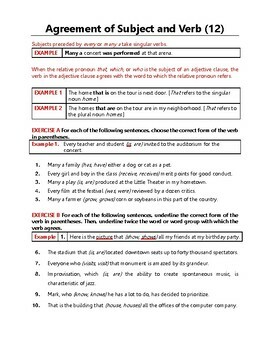 In this resource, your students will have the chance to learn all about the subject verb agreement rules through a set of exercises that are thoroughly put together to ensure effective usage of such rules; whether in speaking or writing. 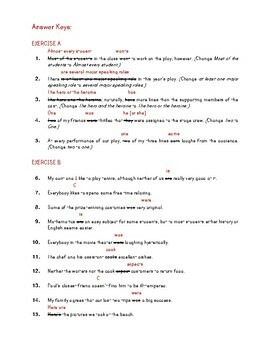 All the worksheets are thoroughly supported with various explanations, tips, definitions, examples, and exercises.